This gated community is centrally located within the Ko Olina Resort and features 60 golf course frontage single family homes and several hundred garden view townhomes. Our select portfolio of fully furnished townhome condos feature free wifi, washer/dryer, garage, outdoor pool, jacuzzi spa and BBQ area. This beautiful neighborhood is a short walk to Ko Olina Resort shops, restaurants and beaches. Scroll down to see available vacation rentals. All properties can be booked online. This gated community is centrally located within the Ko Olina Resort and features 60 golf course frontage single family homes and several hundred garden view townhomes. Our select portfolio of fully furnished townhome condos feature free wifi, washer/dryer, garage, outdoor pool, jacuzzi spa and BBQ area. 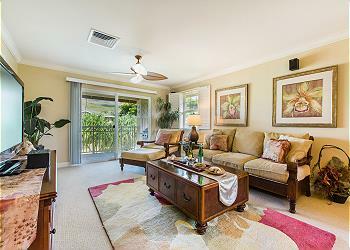 This beautiful neighborhood is a short walk to Ko Olina Resort shops, restaurants and beaches. Scroll down to see available vacation rentals. All properties can be booked online. Ko'Olina vacation home away from home. Enjoy FREE Wifi, as well as all the resort amenities, shops, dining options, oceanfront lagoons and beaches, pool, jacuzzi, and BBQ areas. Upgraded and spacious Ko Olina Resort golf estate home in gated community of Ko Olina Kai. Enjoy recent updates, Wifi, golf cart, beach cruiser bikes, surfboards, marina, oceanfront lagoons, beaches, pool, whirlpool spa, BBQ grills, shops and restaurants!